“Karuizawa nanaoike no suiei“, c. 1930. 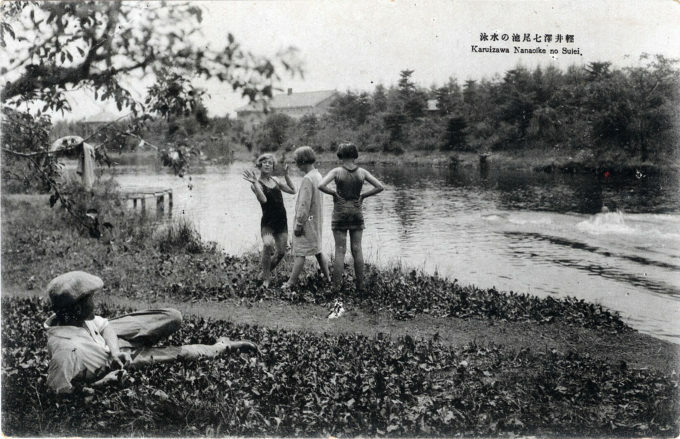 A group of gaijin swimming at the Seven Slope Pond. “Karuizawa is an old post town, turned into a summer resort by Westerners in the late nineteenth century. Looking for a place to escape the intense summer heat of the city, a missionary discovered this locale, deep in the mountains, often veiled by mist and fog, far above sea level. “One by one the expatriates came, and soon Karuizawa, after years of lying remote and unvisited following the advent of the railway age, was transformed into a bustling summer retreat for Westerners. “In modern history, Japan was one of the few countries in Asia that never fell to Western rule. Yet, Karuizawa became a virtual colony – no, a mini-Europe within Japan. It was a special enclave where one could hear organ-accompanied hymns, watch children with curly hair play, and smell ham, sausages, and cheese dangling in storefronts on the main street.